1 cent per mile fuel costs—how does that compare to your current ride? 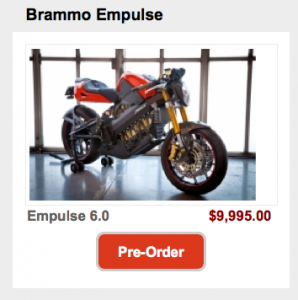 Brammo electric motorcycles is now taking online-orders for the Brammp Enertia and the 100 MPH/100 Mile range electric motorcycle versions of the Brammo Empulse and Empulse R.
Brammo electric motorcycles have made it possible to travel or commute for 1 cent per a mile without CO2 emissions! Brammo’s Empulse has a top speed of 100 MPH and a 100 mile range! Optional Brammo hard saddle bags and top trunk. Brammo’s two-wheel EVs are being offered in three different versions, but unfortunately none of them are the Racing version (Brammo Empulse RR) that just won the Infineon Raceway installment of the TTXGP Formula GP. Still Brammo seems to have the best stock electric motorcycles and easily the most attractive promotion girls on the tradeshow circuit. The Brammo’s Empulse builds on the strengths of their previous electric motorcycle model the Enertia. The Empulse features Brammo’s new Digital Drivetrain technology, which enables all models of the Empulse to exceed 100mph for sustained periods. The Empulse is also the world’s first production electric motorcycle to feature water cooling. Brammo’s Empulse comes in three different models (6.0. 8.0 & 10.0) which relates to the expected range (based on the size of the battery pack). One thing to keep in mind is that the range of EV’s (just like most any other vehicles) is affected by the total weight carried (rider & cargo), road conditions, traffic and riding style etc. It seems to me that Brammo doesn’t even need their popular Brammo promo girls when they can just advertise 1 cent per mile fuel transportation costs.